Right now I'm thinking a lot about sports. I also used to play in a noisy punk band. My writing has appeared in Yes Yes Yes Magazine, It's Night in San Francisco, But it's Sunny in Oakland, on my weird Tumblr portfolio, and numerous 826 Publications. In this talk, I walk through the history of ghosts and the after-life. How changing "ghost hunting" technologies—from the medieval magic circle, to the spirit rapping of the 19th century, to the modern day EMF readers and electronic gear reflect our changing conceptions of what a ghost actually is, and by extension, how our ideas of what it means to be a person have changed. Actually kind of a long talk that I delivered really fast. In this talk I look at the history of slow motion film, from the first motion films of Edweard Muybridge to the (not actually really slow motion) Matrix bullet time sequences. I try and parse out some of the meanings of slow motion in film from The Man with the Movie Camera to The Royal Tennenbaums. I also look at the rise of slow motion film in instant replay and scientific applications. As time passes our ability to create slower and slower motion sequences at higher and higher resolution. In parallel, we slice up our lives into smaller pieces, and much of our work is turning into smaller and smaller micro-tasks. The idea is what are we getting as we search for more certainty, more efficiency, and a more complete understanding of the world? What is lost? This talk was so fun! I look at the history of (mostly) West Coast utopian architecture, starting in the mid-20th century, and landing somewhere in the middle of the Googleplex. In this talk I look at some of the impulses that drove architects like Ant Farm to create their visions of architectural utopias and how those visions have played out (to mixed results) in reality. 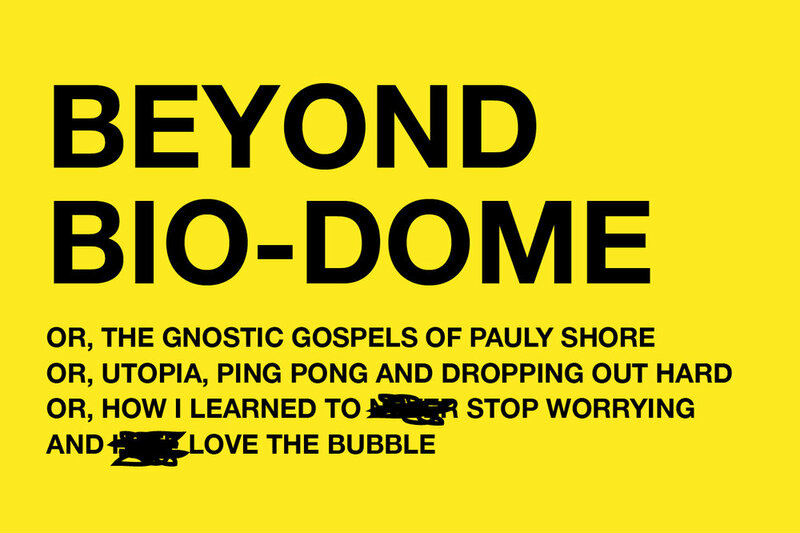 Also discussed in this lecture: Mad Max Beyond Thunder Dome, Bio-Dome, and a few other films. A talk mostly about Fort Bragg and about how to start a museum in a week. A talk given about the surprising history of Snow Park in Oakland, and the idea of the Natural History Museum, how we relate to animals in cities, and more. Way back, I hosted and judged Literary Death Match a couple of times. True fact. Also, this! I played for about a million years in this band and another band called Up The Voltage! We toured the country a couple of times, playing DIY basement venues in pretty much every state. Also recorded a couple of records and made some incredibly low budget music videos.